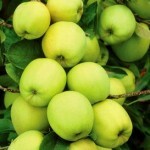 A long time favorite, this apple is a sweet, well flavored variety. It is good for eating fresh and cooking. It ripens in mid-season with yellow skin. It is self fertile and a good pollinizer of other apples. (700 hours chilling) Budded on semi-dwarf rootstock. It needs full sun and a well-drained soil.